On the 12th of July 2013 St. Crispin’s School was awarded the prestigious NACE award recognising the high quality provision given to our Able, Gifted and Talented pupils. The Award is given by NACE: the National Association for Able Children in Education, a leading national education organisation and registered charity. Assessors judged the quality of the school’s work by observing lessons, interviewing the pupils, teachers, parents and governors and by looking at the pupils’ work. Assessors, who spent a day in the school, were impressed by strong leadership and management of provision which keeps the needs of more able learners at the forefront of the school’s work and the good support and challenge provided by the Governors. Out of 3,360 schools, we are the 283rd school to receive this award, a fantastic achievement for the community of St Crispin’s School. 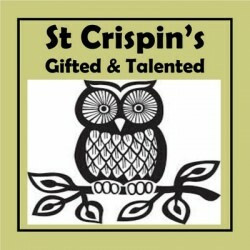 A ‘Gifted’ learner describes a student who is of exceptionally high ability and is capable of excelling in one or more subject, generally the top 2% nationally and the top 5- 10 % of St Crispin’s cohort, each year. A ‘Talented’ learner describes a student who has the ability to excel in practical skills such as sport, art, music and drama. How do we identify a pupil as Gifted and Talented? What happens to a pupil who’s been identified as Gifted and Talented? What is the Gifted and Talented Register? The register is used by all teachers to track progress and ensure that pupils nominated are reaching their targets. Upon entry to KS4, G&T pupils should make 4+ levels of progress. Pupils can be added at any time during their schooling at St Crispin’s School.